Visual Studio 2010 is packed with new and enhanced features that simplify the entire development process from design to deployment. Customise your workspace with multiple monitor support. Create rich applications for SharePoint and the Web. Target multiple versions of the .NET Framework with the same tool. Eliminate the dreaded “no repro” problem with IntelliTrace. And much more. The Windows Azure environment is designed as a utility computing model, so that you pay only for the resources used by your service, while benefitting from the reliability and performance provided by the hosting environment. Windows Azure Tools provide the means to create services and applications within the framework of Visual Studio. That includes a project model specifically for Windows Azure, as well as the debugging capabilities of Visual Studio. With Visual Studio, you can build a package containing your service, and use Windows Azure Tools to deploy the package to Windows Azure through the Windows Live Developer Portal. As demands for application performance increased, customers have traditionally solved the problem by simply increasing the underlying power of the hardware that the application is running on. Over the last several years developers have seen the CPUs that their applications run on start to include 2, 4 or more cores. While the power of the hardware has increased, the transition to a multi-core environment has impacted the applications that developers write. The majority of applications will not be able to automatically take advantage of this multi-core hardware change. Developers will need to modify the way they write applications and the architectures they use for these applications. Creating parallel capable code using current technologies is unfortunately not trivial. Multi-thread programming introduces not only application architecture challenges to complexity and robustness but also exposes the tooling developers use as being optimized for single-threaded development. The .NET Framework 4.0 also provides the core framework support to build parallel applications through technologies such as P-LIINQ and parallel language semantics and framework components. Visual Studio 2010 provides integrated parallel development support. In Visual Studio 2010 the debugger is aware of the parallel nature of code and can present the state of the application execution during debugging across the different parallel execution units. The debugger also has custom displays for parallel code such as task & thread windows and a “multi” or “cactus” stack view window that graphically shows the execution path of the individual tasks. Being able to develop and debug you application though doesn’t mean that it takes advantage of all the available power. To help developers do this Visual Studio 2010 also includes a parallel capable performance analyzer that enables you to extensively instrument you code to visually see the concurrency issues that are in your applications. Combine this with the features of the Visual Studio IDE and developers have a highly productive, visual environment for building the best parallel capable applications available. With ASP.NET Microsoft delivered a ground breaking productive development model that made web applications accessible to the traditional application developer. Over the last few releases not only has the tooling in Visual Studio improved to provide developers with a more web standard set of tools but to provide leading features like CSS property grids and split view design surfaces. However the industry evolves and so do the tool requirements and patterns that developers use. Web developers are leading the push to split content from data and to use a Test Driven Development (TDD) methodology. In Visual Studio 2010 we deliver the next generation of ASP.NET web tools that make it easy for developers to use TDD to build Model-View-Controller (MVC) based web sites. Many ASP.NET Developers have already experienced the preview release of ASP.NET MVC and all the features in that release are included in Visual Studio 2010. Ranging from Project Templates and Solutions that natively describe an ASP.NET MVC website to automatic generation of test projects in the web solutions to wizard support for common tasks like creating views from controllers and snippet support for HTML Markup, the Visual Studio IDE delivers all the support required. Deployment of websites has been a challenge for developers for many years and Visual Studio 2010 has full IDE support for a simplified deployment process for ASP.NET websites. Called “One Click Deployment”, this process and IDE support provides a wizard, dialogs and design surfaces that make it simple for developers to identify the components of a website that need to be deployed and handle the process of moving them from the development machine to the web server, whether that is an internal server for the organization or a server hosted by a 3rd party site. “One Click Deployment” also solves the problem of changing the settings of a website from the development machines to the final deployed site. Many times developers have sent websites to deployment with debug tracing turned on or the database connections set to the development servers. With web.config transformations, “One Click Deployment” enables a developer to create a custom set of transforms that will be applied to the website every time it is deployed and ensures that the appropriate settings are in the configuration files. Additionally Microsoft has just released the Silverlight 2 runtime and tooling for Visual Studio 2008. In Visual Studio 2010 Silverlight is fully supported for developers wishing to build Silverlight content. Having design surfaces for Silverlight enables developers to either author original content or to modify content as part of the designer-developer workflow that Visual Studio enabled in the last release. Visual Studio 2010 also provides full debugging support for Silverlight and provides project system integration for developers consuming this content in various applications types, for example web developers building ASP.NET websites will be able to include existing Silverlight content and Visual Studio will create the appropriate test pages and content includes to enable them to focus debugging on the Silverlight content in the context of the overall website solution. Visual Studio 2010 marks a major renovation of our C++ IDE to not only support emerging trends like parallel computing, cloud and web services but also provide a first class C++ development experience through an IDE that scales to the large size of code bases that are typical of C++ sources. We’re also adding a significant focus on building great experiences for navigating and understanding complex C++ source bases to enable developers to figure out the best places to make source changes in their complex systems. In Visual Studio 2010 the C++ project system has been converted to MSBuild based system that enables developers to take their existing C++ solutions that are currently sectioned to be manageable and bring them into a single solution that provides full IDE support for all the assets in the solution. With a full compiler backing IntelliSense and a true database based symbol system this enables developers to work with large solutions, thousands of files and up to 4GB of symbol information. Visual Studio 2010 provides a C++ IDE experience that includes the return of the MFC Class Wizard, the ability to view large source files through Source Outline, integrated quick searching to find information without the confusion of the current “Find In Files” method and an easily extensible IDE model through the new Managed Extensibility Framework (MEF). 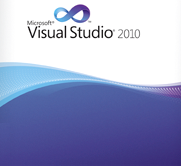 Microsoft Visual Studio 2010 marks a major advance in usability and functionality for SharePoint developers. You can use the new Visual Studio project templates to quickly create or update SharePoint elements such as list definitions, list instances, site definitions, workflows, event receivers, Business Data Catalog models, and content types. In addition, you can use Server Explorer to browse a SharePoint site and its content. You can also import existing SharePoint content using the WSP Importer, allowing you to easily edit its code using Visual Studio 2010. In Visual Studio 2010 we’ve invested heavily in C++ to make developing native Windows applications easier and more productive. We are adding tools to assist developers in building new Windows 7 applications and in making existing native applications take advantage of new Windows features. We’re including full library and header support for Windows 7, significant updates to MFC to support Windows 7 UI elements like the ribbon, live icons, search access and even support for multi-touch enabled interfaces. For developers building WPF based applications Visual Studio 2010 delivers improvements to the WPF design surfaces with richer graphical editing features, better alignment to underlying WPF functionality and integrated data binding from the properties grid and data sources windows.